I was looking at an opening position the other day. As you do. I started shoving the pieces around and before I knew it a king and pawn endgame had appeared on the board. The position at the head of today’s blog, in fact. I’d left an engine (HIARCS) running while I was playing around and noticed that in its esteemed opinion, the evaluation of the position was "+1.14". I can’t say I found that to be particularly helpful. 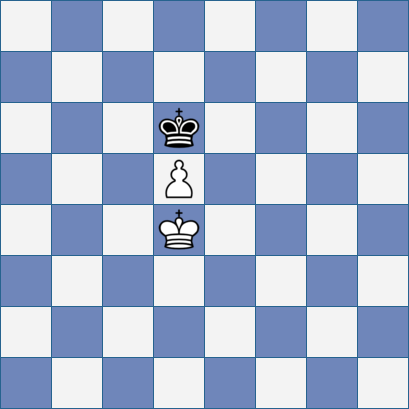 What is "+1.14" supposed to mean in the context of a pawn ending? Engine evaluations are fine for middlegames. A little over +1? Well you’ve got a clear edge. Not enough to say you’re winning just yet, but it’s certainly beyond +=. Pawn endings? They’re won or drawn aren’t they? A numerical evaluation just seems irrelevant (that’s when the Bloody Iron Monsters aren’t botching it entirely - see Our Electronic Pals: Then and Now and 53, for instance). ... is mate in 11 (as your computer will tell you in an instant) with White to move rather than 10 or 12 or 25? Surely not. We just want to know that it’s winning for White. ... an evaluation of +0.08, all we need to know about it is that it’s going to be a draw unless Black goes horribly and unnecessarily wrong. So, since engine evaluations of king and pawn endgames are best approached with caution and since - obviously - my own brain is inadequate for the task, I’m going to ask for human assistance. i.e. you lot. Is that position into which I stumbled at the weekend a win or a draw with best play, do you think? If that's the actual position without any pieces, there are those who think that structure defensible and will play an opening that encourages it. 1. e4 d6 2. d4 Nf6 3. Nc3 e5 4. dxe5 dxe5 5. Qxd8+ Kxd8 6. Bc4 Be6. Personally I would think that White has what winning chances there are. In the actual ending, can you get concrete lines out of the engine where White's position demonstrably improves? If not it's giving that assessment because its programmers told it such structures are bad. When it searches, it finds lines that keep the position much the same and so it falls back on the assessment. "Personally I would think that White has what winning chances there are"
- I’m sure you’re right Roger. I guess that’s what "+1 and a bit" means in English. But is it *winning*? PS: You correctly identified the opening from which the pawn ending derived. White wins after 1. f4 exf4 2. e5 King anywhere 3. 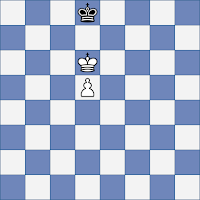 Kf3 g5 4. h4 and Whites active king and space advantage should be enough. Based on a quick glance, I'd say it's a draw - will try to come up with some concrete lines to back it up. You need a stronger engine. Stockfish 6 at d38 shows that is a draw. There's an alternative defence available to 1. f4 exf4 2. e5 Kd7 3. Kf3 . Instead of 3. 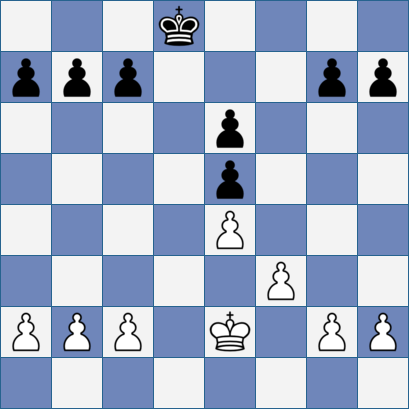 .. g5, Black plays Kxc6 and if 4. Kxf4, occupy the d5 square with Kd5. I was trying to think of a plausible plan for White. I thought perhaps you get the King to c4 and attempt to force a Zugswang. I could believe it doesn't work. Perhaps you are right, but maybe I just need to let my current one run longer. I should have mentioned in the article the assessments were initial evaluations rather than figures that the machine came up with after an hour or so’s thought. DG XXV: "Verghese, chess, Alzheimer’s"